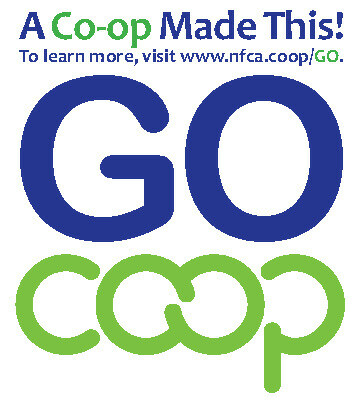 The vision of the Neighboring Food Co-op Association (NFCA) is of a thriving co-operative economy, rooted in a healthy, just and sustainable food system and a vibrant community of co-operative enterprise. By choosing products from co-operative enterprises, you are helping people to help themselves, build stronger, more resilient communities, and strengthen local economies. Below is a listing of some of the co-op suppliers that you may find on the shelves of your local food co-op (look for the “Go Co-op” signs, at right). Within these categories, information is organized by brand with information on the type of co-op (farmer, worker, consumer/worker, etc.) and website address. Then we include a list of some of the products that are available from the co-op. In keeping with our vision for a stronger regional food system, we have underlined supplier co-ops that are either based in our region or have substantial membership in New England, New York State and nearby areas of Canada. 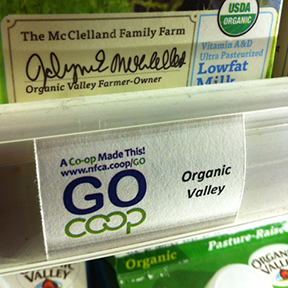 You can look for the “Go Co-op!” signs that identify co-op sourced products, or use this list to find products that may be available at your local food co-op. Almond Products (Organic): Roasted, Blanched, Diced, Sliced, Slivered; Varietals: Carmel, Mission, Nonpareil; Almond Meal. Cheeses: Cream Cheese, Edam, Fontina, Gouda, Havarti, Sliced Cheeses. Cheeses: Beemster X-O, Classic, Farmer’s Choice, Mild, Vlaskaas, Royaal, Glaskaas, Smoked, Goat Cheese, Italian Style, Leyden, Hatch Pepper, Red Pepper, Mustard, Garlic, Wasabi. Milk: Whole, Low-Fat, Fat-Free, Chocolate, Half and Half, Heavy Cream; Yogurt; Ice Cream, Sour Cream. Cheese: Camembert, Mimolette, Pont L’Evêque. Butter, Cheese, Eggs, Margarine, Milk, Sour Cream. Cheese: Cheddar (Adirondack, Extra Sharp and Sharp), Jack (Empire Jack, Empire Pepper), Horseradish, Muenster. Cheese: Medium Cheddar, Sharp Cheddar, Colby Jack, Pepper Jack, Vintage White Extra Sharp Cheddar, Special Reserve Extra Sharp Cheddar, 3-Year Vintage Extra Sharp Cheddar, Monterey Jack, Vintage White Medium Cheddar, Colby, Swiss, Kosher Medium Cheddar, Reduce Fat Medium Cheddar, Smoked Medium Cheddar, Reduce Fat Monterey Jack, Smoked Black Pepper White Cheddar, Gralic White Cheddar, Hot Habanero Jack, Garlic Chili Pepper Jack, Vintage White Smoked Extra Sharp Cheddar. Sliced Cheese: Muenster, Smoked Swiss, Provolone, Baby Swiss, Medium Cheddar. Shredded: Mexican Blend, Mozzarella, Italian Blend, Classic Mac & Cheese. Snack: Tilla-Moos, Cheese Curds. Sour Cream: Premium, Light, Fat-Free, Natural. Yogurt: Light Strawberry, Light Raspberry, Light Pomegranate Blackberry, Light Northwest Berry Patch, Light Mountain Huckleberry, Light Marionberry, Light Peach, Light Vanilla Bean, Light Lemon Squeeze, Pomegranate Blackberry, Blueberry Acai, Banana Vanilla, Oregon Strawberry, Raspberry, Marionberry, Vanilla Bean, Naturally Plain, French Vanilla Bean, Mountain Hucklberry, Peach, Northwest Berry Patch, Dark Cherry, Lemon Squeeze, Cherry Vanilla, Key Lime, Passion Fruit Orange Guava, Baked Apple Pie, Strawberry Apple Pie, Watermelon, Country Orange Cream. Fish: Reefnet Wild Salmon (Pink Salmon, Smoked Pink), Scallops (Alaska), Caviar (Chum Salmon, Coho Salmon), Black Cod Steaks, Halibut (Alaskan), Wild King Salmon, Wild Sockeye, Sockeye Nova Lox. Produce (Organic): Beans (Green), Beets (Red, Specialty), Broccoli, Cabbage (Green, Red), Carrots, Chard (Green, Red), Collards, Corn, Cucumbers, Fennel, Kale (Green, Red, Purple, Lacinato), Leeks, Lettuce (Greenleaf, Red, Romaine), Onions, Peppers, Parsnips, Potatoes (Red, White, Yukon), Rutabega, Summer Squash, Winter Squash (14 Varieties), Tomatoes, Turnips, Zuchinni, etc. Produce (Organic): Apples, Asparagus, Beans, Broccoli, Cabbage, Chard, Garlic, Kale, Lettuce, Sweet Peas, Radishes, Raspberry, Rhubarb, Summer Squash, Strawberries, etc. Produce: Apples, Beets, Beet Greens, Blueberries, Bok Choy, Cabbage (Chinese, Red, Savoy), Carrots, Chard (Swiss), Collard Greens, Corn, Cucumbers, Eggplant, Kale, Onions, Parsnips, Potatoes, Rhubarb, Strawberries, Squash (Acorn, Hubbard, Spaghetti, Yellow Summer), Tomatoes, Zuchinni, etc. Agricultural co-ops are common in wine-making, and in many regions of the world have enabled often very small grape growers to sustain family farms over generations. This list is not complete, but it does include some of the more common brands that have been sighted on food co-op shelves in our area or are available through regional distributors. Organic, Fair Trade Certified wines: Torrentés Chardonnay, Malbec/Syrah. Fair Trade Certified wines: Bonarda-Malbec, Cabernet Sauvignon, Chardonnay, Malbec. Brunello di Montalcino, Chianti, Pinot Grigio, Rosato, Ser Piero, Trebbiano, Vincanto, Grappa, etc. Beaumes de Venise, Chateuneuf de Papes, Cotes du Rhone, Cotes du Rhone Villages, Gigondas, Vacqueyras, Ventoux, Vin de Pays. Cabernet Sauvignon, Chardonnay, Merlot, Moscato, Pinot Grigio, Pinot Noir, Riesling. Cabernet Sauvignon, Chardonnay, Cococciola, Merlot, Montepulciano, Pecorino, Pinot, Trebbiano d’Abruzzo. The Gondolier Chardonnay, I Casali Pinot Grigio, The Gondolier Pinot Grigio, The Gondolier Pinot Nero. Blush Bianco, Lambrusco, Lancellotta, Peach Chardonnay, Raspberry Cabernet, Rosato, White Lambrusco, etc.